more - a few billion dollars more. 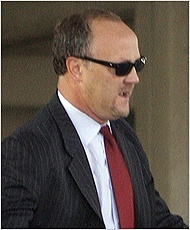 Bradley C. Birkenfeld was sentenced to 40 months in prison for helping rich Americans dodge their taxes. are pretty good - it would be the largest reward of its kind. represented Linda Tripp, who helped expose the Monica Lewinsky scandal of the Clinton years. "We are seeking at least several billion dollars," Mr. Kohn said. Mr. Kohn stands to reap a fortune if Mr. Birkenfeld wins his case. recent years, the Internal Revenue Service has quietly embraced whistle-blowers like Mr. Birkenfeld to help root out tax cheats. taxes, fines, penalties and interest ultimately collected by the I.R.S. - billions of dollars, in the case of UBS. Shulman, the I.R.S. commissioner, has said that he expects "billions"
of dollars to roll in from the amnesty program. a portion of that settlement. filed in Mr. Birkenfeld's case. be named, given the sensitivity of the matter. stopping offshore tax evasion, it will reward Mr. Birkenfeld," he said. The I.R.S. declined to comment on Mr. Birkenfeld's case. "It creates a pretty unseemly situation," the senior Justice Department official said.